London, Jan 2 (IANS) Old habits die hard, and in this case never, as model-actress Elizabeth Hurley and ex-flame Shane Warne couldn't resist the temptation to flirt again - so what if it's online? The Aussie spinner initiated a conversation with the mother-of-one Saturday when he asked her if she had any resolutions for 2011 and she gladly replied despite their fall out recently, reports dailymail.co.uk. "Lots of them and they all begin with Start or Stop...," she responded. When Warne questioned what she meant, Hurley retweeted: "You're being blonde...as in Stop eating sweeties and Start doing situps." The flirty banter suggests things are back on track with the two, whose relationship was revealed through their conversations on Twitter after photographs of them canoodling each other emerged recently. But, when Liz came to know about Warne two timing her by sending racy texts to another woman, the 45-year-old actress dumped him and begged for forgiveness from her Indian textile tycoon husband Arun Nayar, whom she apparently dumped for the cricketer. She had, however, put out an impulsive statement on Twitter that she and Nayar had separated "months before" her affair became public. But she didn't forget to keep a door open for herself at the Nayar's by praising her husband's bonding with her son Damian. 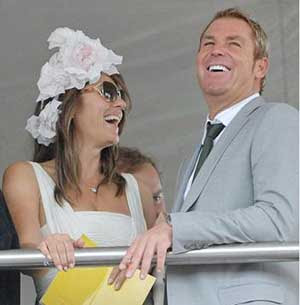 And now that Liz appears to be enjoying Warne's company once more, the cricketer is said to be hoping their relationship can get back on track following reports she will be flying out to Australia this week to see him during the Ashes Test in Sydney. "Shane has feelings for Liz and they got on fantastically well when they were together. He really hopes he can see her again this week and patch things up," said a source.